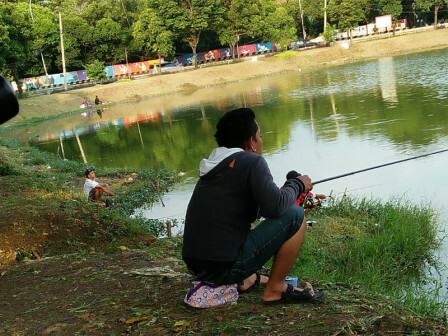 " Its location is precisely on the roadside, surely it is so fun"
For anglers, ponds which are located near the Pulogadung Bus Terminal, Cekung, East Jakarta offers spots to enjoy fishing. Herman (29), a Pulogebang citizen said that it is very crowded by tens of people on weekends, but only a few on weekdays. There are three ponds. Most anglers are from Jakarta and other regions. "Its location is precisely on the roadside, surely it is so fun. We can fish while gathering with other people here," he expressed, Wednesday (3/20). Similar statement also came out from Amran (39), one of anglers from Bintara, Bekasi, West Java. He goes to fish while healing his fatigue. "They want to be patient, we will get the big one," he expressed. He added that fishes which can be fished from these ponds, namely mujair, parrotfish, catfish and gold fish. "Every weekend or holiday, I can fish longer," he said.